"Mummy's making French flies for supper." You see...it IS possible to make new friends on the web. Waitress! There is a Fly in my soup. Sorry, I’ll get you a fresh soup. No, that’s just how I like it. When you can't find anyone to invite to your tea-party. "It's all right for you lot just sitting there being waited on. It's time to clear up. Who's going to give me a hand, a hand, a hand, a hand..."
The tea parties aren't so bad. It's when she starts playing schools with them and gets cross about their handwriting. Charlotte would do anything to stop Jeff Goldblum visiting. Now be careful Samantha. You know Funnel Web's only like Darjeeling. Noooo- how many more of these Spiderman origin movies? "Oh, yes please - with great power comes a great thirst for tea." "Hold STILL, she could be a brat." 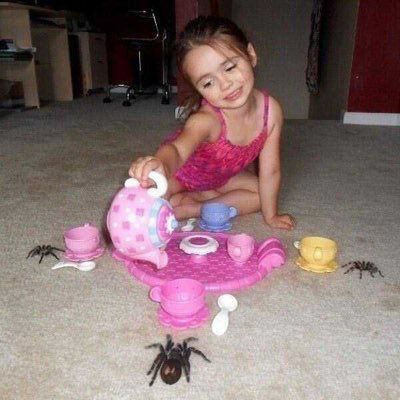 Young children having tea parties with dangerous spiders should not be left unsupervised. This message has been brought to your attention by PG Tips. They're big fangs of her black fly tea. Peter Parker's daughter loves playing hostess. You want me to be Spider Mam. They're making spider-silk dresses smaller and smaller these days.